September seems set to be the month where the boxing schedule really kicks off and we begin to get a lot more fights of note featuring Asian fighters. As a result we've broke the month into two, looking at some of the most notable fighters involved fighters from the Asian boxing world. On September 7th Kazakh prospect Sadriddin Akhmedov takes a huge step up in class to face tough Argentinian Bruno Leonardo Romay. This will be the biggest test so far for the 20 year old Kazakh who is fighting out of Canada. As part of Superfly 3 we will see Filipino's clash with former 3 weight world champion Donnie Nietes taking on Aston Palicte. This bout will crown the WBO Super Flyweight champion and should be a very interesting match up, with Nietes being the older, smaller but smarter fighter. After almost 17 months away from the ring Japan's popular Kazuto Ioka returns, making his US debut on Superfly 3. In the opposite corner to the former 3 weight champion is McWilliams Arroyo, a 2-time world title challenger who is looking to defend his WBC Silver Super Flyweight title. Teenage prodigy Dave Apolinario goes for his first title as he faces the limited but hard hitting Michael Camelion. There is serious expectations on Apolinario's shoulders, with the 19 year old southpaw expected to be the goods, and this bout should tell us something about how good he is. Fans at the Korakuen Hall get a real treat as Japanese based Filipino Mark John Yap takes on Takuma Inoue, the younger brother of Naoya Inoue, in a WBC Bantamweight world title eliminator. We have this down as one of the best match ups of the month and could end up being a real thriller! Japan's first ever 5 weight world champion Naoko Fujioka looks to defend her WBA Female Flyweight title. In the opposite corner will be interim champion Irma Sanchez of Mexico. It's hard to see past the Japanese boxing queen here, but at 43 years old we do wonder how long she has left. Former Japanese Light Welterweight champion Hiroki Okada makes his US debut, as he battles veteran Coria. The bout is the start of a multi-fight deal between Okada and Top Rank with the intention being to have him fight WBC champion Jose Ramirez somewhere down the line! Chinese prospect Jing Xiang goes for gold as he faces former Filipino world champion Merlito Sabillo in a bout for the WBC Silver Light Flyweight title. Jing is riding a 6 fight winning run coming into this bout and Sabillo really can't afford another defeat, or that could be the end for him. Unbeaten puncher's collide as Kazakhstan’s Aidos Yerbossynuly takes on Azeri foe Rufat Hajiyev in a bout for a regional WBC Super Middleweight title. This may not be a bout featuring big names but given the style of both men, and their power, this could be a very explosive encounter! The biggest bout of the month, by some margin, will see the two pre-eminent Middleweight fighters collide in a highly anticipated rematch. In one corner will be Kazakh puncher Gennady Golovkin and in the other will be Mexican star Saul “Canelo” Alvarez. Nothing else needs saying here! Heavy handed OPBF Light Heavyweight champion Aaron Lai looks to make his second defense of the title that he won in February 2017, as he faces off with Japanese foe Shintaro Matsumoto, a former OPBF Super Middleweight champion. This could be a very explosive and short contest! Given how stacked the end of the month is, we'll be putting part 2 up towards the final couple of weeks, and it really does look like a sensational way to end September 2018! If you ask me 2013 has been one of the most remarkable years in recent memory for boxing. It seemed that every other week we had some major story or event, many of which have been forgotten simply due to the fact we've had that many. One of the best things about the year was simply the number of great fights we had, they seemed like they were coming thick and fast with very few weeks not giving us a possible FOTY candidate. A short list for FOTY could have included the likes of Nihito Arakawa v Omar Figueroa, Kohei Kono v Liborio Solis, Ryo Miyazaki v Jesus Silvestre, Koki Eto v Kompayak Porpramook, Merlito Sabillo v Carlos Buitrago and of course Ruslan Provodnikov v Timothy Bradley amongst numerous other bouts. For 2014 I'm hoping for some equally great fighters and with that in mind I'd like to give you my "14 fights for 2014" list. Super fights in the sports lowest weight division have been rare with the most notable being Kazuto Ioka's unification bout with Akira Yaegashi in 2012, Ricardo Lopez's 2 battles with Rosendo Alvarez in 19998 and Lopez's bout with Alex Sanchez in 1997. And, yes, I know I'm bending the term "super fight" for Lopez/Sanchez. Right now though the sport has the possibility to give us a genuine mega fight at 105lbs with Katsunari Takayama (26-6-0-1, 10), the IBF champion pictures fighting Isaac Bustos, and Xiong Zhao Zhong (22-4-1, 12), the WBC champion, meeting in a unification bout that has every sort of story behind it you could wish for and styles that should gel. Takayama, my choice for "Comeback Fighter of the year 2013", has a great style that features a lot of movement and a lot of aggression with his hands and feet going almost non-stop. He's a man who is widely regarded as the best fighter in the division and is also viewed as one of the sports "hidden gems". The Japanese fighter is a proven fighter, a happy traveler and someone very special to watch. Whilst Takayama is a hidden gem of world boxing Zhong is a man who is widely derided as a paper champion, despite holding a notable win over Filipino Denver Cuello and a close loss to then Flyweight champion Daisuke Naito. Zhong is a physical freak, he's like a bull with insane strength, a clumsy style but a real toughness to him. Style wise it's the speedy boxer against the crude fighter and they can go either way. Aside from the styles we have the personal story of the two men. Takayama is a man who handed in his JBC license to chase the IBF title, he has previously held the WBC belt though strikes me as a man who wants to prove he's the best and will try to unify the titles. For Zhong, China's first and only male world champion, it makes sense to try and prove you're the best and unify with a guy who is viewed as being better than you. Then you have the political story with China and Japan. The 2 countries are certainly not on "friendly terms" right now and this fight could well be viewed as the "Louis v Schmeling" of the East. You want a super-fight at Minimumweight then this is the fight we need! At the time of writing I'll admit I'm going to make some assumptions. One of those is that Kazuto Ioka successfully defends his WBA Light Flyweight world title on December 31st. A continuation of that is that Ioka then vacates the title leaving the door open to his stable mate Ryo Miyazaki (20-0-3, 11) to attempt to win the vacant Light Flyweight title. One man who has been open about wanting that very same WBA title is super-prospect Naoya Inoue (5-0, 4) and from where I'm sat that bout makes a lot of sense. Miyazaki is of course the more experienced fighter but he's not looked that great in his 3 world title fights at Minimumweight, I'm not sure that will change significantly at Light Flyweight where Inoue is genuinely looking like the "Monster" he's being tagged as. I'd say that Miyazaki's experience edge would be out-weighed by the skills edge that Inoue has. From the fighters perspective it's a fight that makes sense. Miyazaki will clearly want a world title having recently vacated his Minimumweight belt, and Inoue has said that he wants to claim a world title in 6 bouts, a Japanese record. It'd be a massive shock if Fuji TV wouldn't push this fight if the opportunity was there for Inoue's first fight of 2014 and with Miyazaki fighting on New Years Eve it'd make sense for an April or May date. Likeliness of happening-8/10. The fight depends on a few things, but they should all run as expected with Ioka beating Felix Alvarado and Miyazaki beating Fahlan Sakkreerin Jr on Dec. 31. Following on with the assumptions made in the above bout I'd expect Kazuto Ioka (13-0, 9) to move to Flyweight in an attempt to become Japan's second ever 3-weight world champion. The logical bout for Ioka at Flyweight would be a rematch with former rival Akira Yaegashi (19-3, 9), the current WBC champion. For Ioka this bout would be about becoming a 3 weight champion and adding to his already fantastic legacy. A second victory over Yaegashi would effectively put Ioka on the fringes of the "pound-for-pound" lists, especially considering what Yaegashi has done in 2013. For Yaegashi though the reasons for the rematch are clear, setting the record straight. Many felt Yaegashi beat Ioka when the men first fought, in 2012, in what was a WBC/WBA Minimumweight unification bout and a chance for revenge should be reason enough for Yaegashi to push for this fight. The fight would be backed up with TBS's money so both men would be well paid, fans would certainly not mind this after how fantastic their first bout was and as mentioned both fighters clearly want the bout. There are very few stumbling blocks and in all honesty I can't see why this isn't one of those bouts that has been "all but signed". Yes Ioka needs to defeat Felix Alvarado first but that's about it. Oh and can I just say that the poster for fight I, opposite, was a great poster, a rematch would likely see an equally as good one. Likeliness of happening-9/10. If Ioka beats Alvarado then this bout really should be made for the first half of 2014. At a push Q3 2014 if Ioka has a tune up at 112 and Yaegashi takes a "gimme" in the interim. Few fighters have impressed me in 2013 as much as Thai destroyer Srisaket Sor Rungvisai (23-3-1, 21) who ripped the WBC Super Flyweight title from Yota Sato in a year that saw him bagging 7 victories. Yes, you read that right Srisaket fought a amazing 7 times this year whilst also winning and defending a world title. The Thai has had one of the stand out years in Asian boxing though will be hoping to get a big inter-continental victory on his record in 2014. The obvious "inter-continental" opponent for Srisaket is Mexico's Carlos Cuadras (28-0, 23), the WBC's #1 ranked fighter and a fighter with an aggressive, fun to watch style. If you've seen both men in action you'll almost certainly see this as a potential FOTY with both coming to fight and both having power, confidence and plenty of flaws defensively. With Cuadras fighting in Japan on New Years Eve it's a fight that has the relative feeling of being distinctly possible. Cuadras's #1 ranking makes it his only real way to a world title, for now, and he'd be foolish to look else where with the IBF and WBA both having their next fights lined up whilst the WBO don't rank Cuadras at all. The one sticking point could be venue with Cuadras having never fought in Thailand and it'd be unlikely that Srisaket would leave his homeland at this time. If Cuadras will take the fight he'd likely have to travel to the homeland of the champion which as we know is an awful place for visiting fighters, though with Thailand's Channel 7 televising the show and Nakornluang Boxing Promotion backing it, this would make a lot of sense in the first half of 2014. Likeliness of happening-9/10. Cuadras has a gimme on New Years Eve, following that there is little preventing this possible FOTY from taking place early in 2014. It was only a few weeks back that Koki Kameda (32-1, 17) vacated the WBA Bantamweight title to avoid a fight with Anselmo Moreno. The Japanese fighter may have been ducking Moreno though he himself has stated that he is merely dropping down to 115lbs to win a title before his body out grows the weight. Winning a title at Super Flyweight would further cement Koki's legacy as he would become Japan's first ever 4-weight world champion. Despite being controversial there is little doubting that Koki's name would be legendary if he managed to become a 4-weight world champion. Unfortunately for Koki his plans to be a champion at Super Flyweight seem to be scuppered by the fact that his options are very limited at the weight. One option would be taking on Srisaket Sor Rungvisai, a man I believe would stop Koki, another would be awaiting the winner of the Kohei Kono/Denkaosan Kaovichit bout for the WBA title, a third option would see him wait to see how his brother Daiki Kameda fares with Zolani Tete in an IBF mandatory. The only "open" option would be a WBO title fight with Argentinian veteran Omar Andres Narvaez (41-1-2, 22). Ranked highly by the WBO this bout makes a lot of sense for Koki who may well try and request that he becomes the mandatory challenger for Narvaez. Their would of course be several issues. The camps of the men would have to sort out, including venue, money and a deal with TV companies in both Japan, TBS, and Argentina, TYC Sports, but a deal could likely be thrashed out. A few stumbling blocks, of course, but on the flipside this is a bout that could make sense to the fighters. It allows Koki a chance at a 4th title against a credible but aging champion and it would allow Narvaez to claim a nice pay day, win or lose. Likeliness of happening-6/10. Issues involving TV, Venue and possibly even Felipe Orucuta could scupper this, as could the JBC who still haven't said whether they will punish the Kameda's for the "Daiki situation". If the JBC strip Kameda of their gym license then this bout would have to be fought away from home, be it Argentina or a neutral venue and that alone could completely scupper the fight. The Bantamweight division has certainly been an interesting one this year, however you look at it. From a Japanese perspective however they've gained a new champion in WBO belt holder Tomoki Kameda whilst lost one in Koki Kameda who showed that he was pretty scared of Panamanian Anselmo Moreno (34-2-1, 12), the WBA "super" champion. One man who doesn't seem to have that fear is Shinsuke Yamanaka (20-0-2, 15), the WBC champion, and it's fair to say that the biggest fight at Bantamweight would see those 2 men colliding. The fight is one that Yamanaka has spoken about, though seemed to suggest that he'd rather move up a division to fight Leo Santa Cruz, and is one that would put the #1 and #2 fighters at 118lbs against each other. Something that I tend to like to see where ever possible. Whilst it's divisionally a major bout the key issue regarding the contest would actually be a stylistic one. Yamanaka, although a capable boxer, is certainly a man who can be made to look bad by fighters with speed, as he was by Alberto Guevara early in their bout. Moreno is a fighter with speed, trickery and a style that will be a nightmare for Yamanaka. I think this is a bout that Yamanaka will know is difficult for him and would likely try to get Moreno over to Japan for it if it was to be made. In terms of problems about the bout we may well see issues in regards to TV and money. Yamanaka, for all his skill, had his last fight shown on WOWOW and may struggle to get a better TV deal for a Moreno bout which may force him to travel to Panama, a decision that he may not be willing to take. If they could arrange a bout that suited TV in both countries or draw more money by being in the US then that's probably the most likely way this bout gets made. If it's in the US we'd imagine Golden Boy Promotions may be interested in having it on a card with the winner being set to move up and fight Santa Cruz for another big pay day. Likeliness of happening-6/10. Again TV issues are the biggest problems though if Golden Boy are willing to set this up with the winner to get a Santa Cruz bout then it's a possibility that we could see this probably around summer. Japan's only ever WBO world champion Tomoki Kameda (29-0, 18) has got a pretty straight forward to make bout if he wants to take it and defend his family's name. Tomoki, who has already defended his belt once, should be looking at Venezuelan Liborio Solis (26-3-1, 7) the man who beat his brother Daiki Kameda late this year. Solis has shown a willingness to travel to Japan for fights, having fought his last two there, and has also shown an ability to win on foreign soil having beaten both Kohei Kono and Daiki Kameda in Japan. Unfortunately though he was also stripped of his WBA Super Flyweight title in Japan after failing to make weight for his bout with Daiki. From Solis's view this should be a chance to reclaim a world title, beat another Kameda and finish off a hat-trick of victories in Japan, for Tomoki the chance to avenge Daiki's loss should be the key. Standing in the way of this fight is very little. Solis's 2 fights in Japan were both action packed and exciting, he has a style that has been fun to watch, TBS of course showed his last bout and it's an easy one for TBS to "sell" to fans. I would assume both of the fighters would want to have the fight and for Solis it's possibly his biggest paying opportunity. The only issue is the aforementioned possibility that Kameda Gym get stripped of their license, something I doubt will actually happen and even if it does the fight could take place in the Philippines, Mexico or South Korea with out the JBC's blessing. Likeliness of happening-9/10. Very little standing in the way of this one, though it may take place late in 2014 as opposed to being Tomoki's first fight of the year. A bout I've liked for a while would be one between former 2-weight world champion Hozumi Hasegawa (33-4, 15) and Cuban sensation Guillermo Rigondeaux (13-0, 8) the WBA and WBO Super Bantamweight world champion. The bout is one that I've wanted for a while though have the feeling I'll be left wanting unfortunately. For Hasegawa it's a bout he seems happy to have even if it involves traveling. He is highly ranked by both the WBA and the WBO and a bout that should please both of them and looks straight forward on paper. Unfortunately the problems are from Rigondeaux's position. He's become a fighter that HBO are failing to really sell, he's a man who has managed to take bums off seats and has been unable to accommodate the business side of boxing. In terms of his skills he's exceptional but his last 2 bouts have both been dour affairs. Unfortunately from HBO's point of view Hasegawa is completely unknown in Japan. He's unlikely to draw much attention and although the fight would be entertaining they may not be willing to take the risk on it. Oddly though whilst they'd be unwilling to headline a show in the US with the fight they may be willing to accept the fight if it was on a major under-card, perhaps in Macao. The Maca0 cards have seen Top Rank taking some risks in terms of the fights they've been making and this would fit in perfectly with those fights whilst also drawing Japanese gamblers to Maca0, giving Hasegawa a chance to become a 3-weight world champion and giving Rigondeaux an opponent he could look very good against. Likeliness of happening-4/10. I really can't see HBO pushing for this, I can't see Rigondeaux really wanting it and I can't see the Cuban being "bullied" in to taking the fight even though the money in Macau could be worth it. If you're an American or a Mexican you will view this as a massively controversial choice though for me Takashi Uchiayama (20-0-1, 17) against Takashi Miura (26-2-2, 19) is the bout at Super Featherweight. Uchiyama, the long reigning WBA champion, is the guy who is the #1 in the division. His wins are the best there on paper with victories over Juan Carlos Salgado, Takashi Miura, Jorge Solis and Bryan Vazquez and he's a man who appears to look unbeatable at times. Behind Uchiyama I'd argue that Miura, the WBC champion, has the second best series of wins at Super Featherweight with wins over Gamaliel Diaz and Sergio Thompson both coming in 2013. Add on an expected victory over Dante Jardon and you have a trio of great wins on Miura's record. In terms of the first fight it was a difficult one for both men. Uchiyama was dropped hard by Miura in round 3 before slowly breaking down Miura who was later forced to retire in his corner. Since then both men have suggested fighting each other again and with the WBA and WBC titles on the line the bout makes a lot of sense domestically. For some though Miura's a nobody and Mikey Garcia should be the target of Uchiyama. That on paper would probably a bigger bout stateside though is unlikely to really interest Uchiyama as much as second bout with Miura. The WBO belt held by Garcia is unlikely to get Miura's interest, especially with the way Japanese fans feel about the WBO and unless Garcia will travel that fight is very unlikely to get Uchiyama's attention. As with Yaegashi/Ioka rematch this bout depends on bouts that take place on December 31st. Uchiyama will need to get past Daiki Kaneko and Miura will need to cap out his year with a victory over Dante Jardon, though we are going with both of these 2 to come out on top in their bouts. Likeliness of happening-9/10. I think this is one of the most likely bouts. If both men come out on top in their upcoming defenses expect this to be signed in 2014 with neither men expecting a mandatory in the first half of the year. We, as fight fans, love wars and we love big punchers. There are few fighters in the sport right now combine heart and power like WBO Light Welterweight champion Ruslan Provodnikov (23-2, 16) and Argentinian Lucas Matthysse (34-3, 32). The two men, if they were put in to the ring together would give fireworks as long as their bodies could survive and by the end of it we may well have seen one of those rare classics that live on well beyond the careers of both men. For Provodnikov 2013 was his break out year with 2 FOTY candidates, for Matthysse the year was disappointing with him losing to Danny Garcia. Despite the loss however Matthysse is still a man that fight fans will want to see again and again. Of course if this bout was made neither man would ever be the same, but we'd have something special to remember them both for. When it comes to being unlikely we'd hazard a guess that this as unlikely as they come. Provodnikov appears to be on the verge of becoming a HBO staple, a man that HBO can rely on to provide excitement, action and as a result ratings. He might not be doing mega numbers but he will do if he continues to put on fights like the two he has had this year. Whilst Provodnikov is a HBO fighter Matthysse is sadly a Showtime fighter and has linked a deal with Golden Boy Promotions ruling this out as bout we're almost certainly not going to see. Despite the bout being unlikely we do expect both men to have great 2014's with Provodnikov looking likely to face Brandon Rios in his first fight of 2014 whilst Matthysse will likely have an "easier" one before he gets back in to the swing of things on the world stage. Likeliness of happening-2/10. This bout would depend on Matthysse some how becoming the mandatory for Provodnikov or the "cold war" between HBO, Showtime, Top Rank and Golden Boy coming to an end, some I can't imagine happening any time soon. At Middleweight there is some bouts set for 2014 though one that isn't is the bout that fans are clamouring for. Although we've got Gennady Golovkin (28-0, 25) lined up to fight Osumanu Adama and Sergio Martinez (51-2-2, 28) seems set to fight Miguel Cotto we've gotta say that we want the winners to fight. We're going to assume that Golovkin stops Adama and Martinez just gets past Cotto. Following those bouts the men could then meet in a "passing of the torch" style fight that allows Golovkin to finally get the win he needs to be accepted as the champion and finally gets to end the career of Martinez. I understand that Martinez isn't the fighter he was. His body is falling to pieces, his career is coming to and end and a fight with Golovkin would rush that ending though on the flipside I'd rather see Golovkin "win the crown" against the champion than to have to fight all the other top contender, many of which haven't shown any interest in fighting him, to become the champion. It's all well and good saying that Golovkin needs to beat the likes of Peter Quillin, Felix Sturm and Martin Murray but those 3 appear to have no interest at all in a fight with Golovkin and are happier to collect titles as opposed to proving they are the best. Likeliness of happening-4/10. This is a fight that fans want and that HBO would want though it has too many stumbling blocks to bother with I'm afraid. It's down to Martinez but I don't think he'll be jumping at the opportunity to face "GGG". There is 1 Light Heavyweight bout that everyone wants. That bout would see WBO champion Sergey Kovalev (23-0-1, 21) taking on WBC champion Adonis Stevenson. Whilst I really like that bout I can't help but feel Stevenson may be wanting to delay the bout whilst he quickly beefs up his bank account with a few swift and relatively easy defenses. There is talk about Stevenson facing Andrzej Fonfara early in the year before looking for someone like Bernard Hopkins or Lucien Bute is decent pay days that won't see him detached from his senses. If Stevenson is kept busy I'd like to see Kovalev in there with WBA "super" champion Beibut Shumenov (14-1, 9) in a bout that would unify the WBO strap with the WBA "super" title. The bout, which would never go the distance, would be fun to watch as both men are technically sound with an aggressive mindset and power, admittedly Kovalev's power is significantly more than Shumenov's. The bout's stumbling block would be TV and the issues surround "the cold war" of HBO and Showtime. One possibility is that one of the channels will get Stevenson v Hopkins and the other channel could have this bout. More likely though is that we end up with Shumenov v Hopkins on Showtime, Kovalev taking on several B grade opponents and Stevenson fighting some second challengers as well as we get left with a number of major bouts going by the wayside. 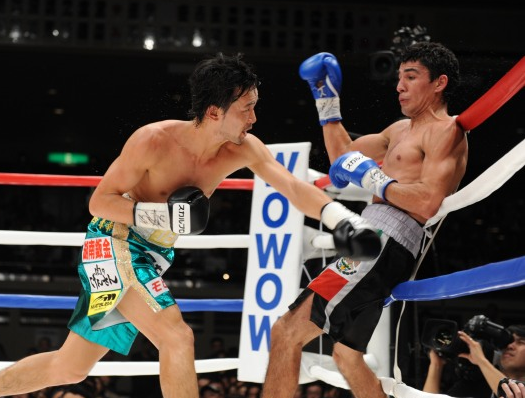 Hard hitting Japanese Super Featherweight Masao Nakamura (17-1, 17) is always a fun fighter to watch win or lose. I'd love to see him in with the promising and highly touted Thai Jomthong Chuwatana (7-0, 4). For the two men 2013 has been a bit of a strange year. Chuwatana defended the OPBF title by defeating Ronald Pontillas, who had himself beaten Nakamura, but unfortunately fought just twice with the most recent of those bouts coming in March. Nakamura on the other hand fought 3 times, and will be fighting again before the year is out, though his opponents haven't been testing. A fight between the two would see Jomthong facing his first puncher whilst Nakamura would have a chance to reclaim the OPBF title he lost to Pontillas. The winner would almost certainly be heading towards a world title fight and the loser wouldn't really be written off. Come on folks lets have this one! When punchers collide we get action and there isn't a better Light Welterweight bout to be made in Asia than Keita Obara (10-1, 9), the Japanese champion, and Min-Wook Kim (11-1, 8), the OPBF champion. Both bang, both come to fight and both are flawed, yet both would put on an amazing fight with the other and it could be one of those rare fights that shines due to the styles and action. The best thing for this fight going forward is that Kim has already fought in Japan, beating Shinya Iwabuchi, and would likely be happy to travel again if the money is right. The winner, of course, would be world ranked and the fight it's self would be great so hopefully we get this one signed at some point. Prior to this fight we imagine Obara will need to have a mandatory defense of his national title which would give Kim a chance to shake any rust having been out of action since August 2012.